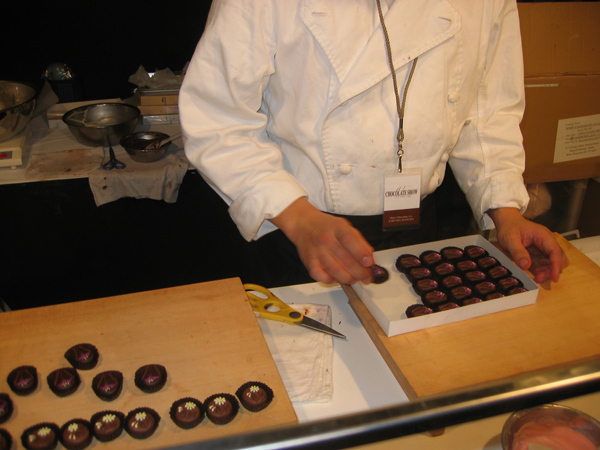 There was the chocolate show in New York this past weekend, and you can bet if they’re handing out chocolate, I’m going. So (surprise! ), I went. It was a hefty and daunting entrance fee ($28) but I’m still glad I went. 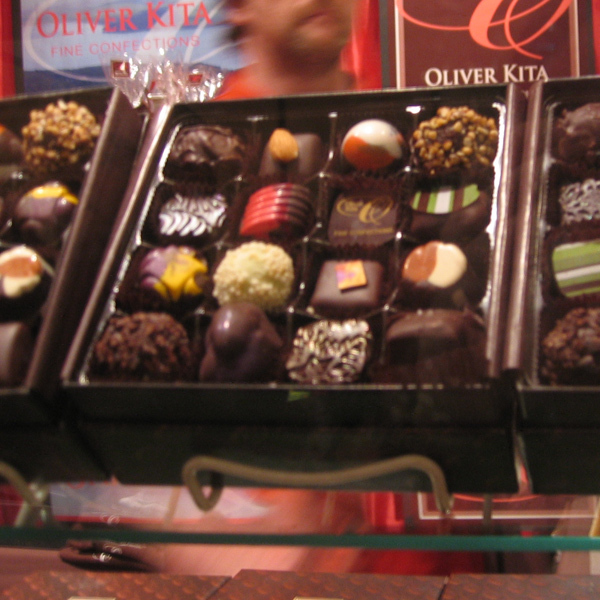 And now, a recap.First of all, I got out at 18th Street between 5th and 6th Avenues, which was one block over from the chocolate show. So I walked that one block and I was SO HAPPY. One that one block was a used-book store, a used CD-and-DVD shop, a printing shop (with a giant purple printing press! 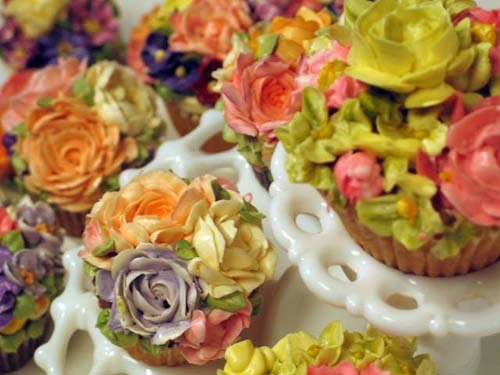 ), several interior design shops with vases and furniture and other goodies, a children’s-book store and Cupcake Cafe. I don’t particularly care for the Cupcake Cafe’s cupcakes (too rich and sweet) but the way they decorate them is stunning. Here is an example I found online. What a marvelous block o’ Manhattan. I must investigate it more when I have the time. On to the chocolate show. It was packed. I must have touched and been touched by a hundred people. But, whatever, chocolate. 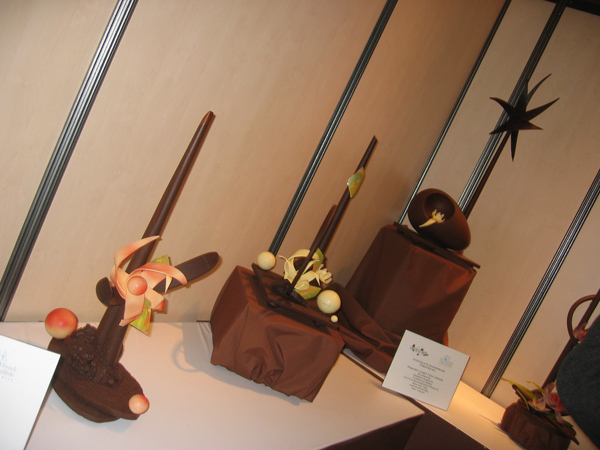 As you come in you see these chocolate sculptures. Do you see that egg-shaped chocolate with white chocolate decoration? I couldn’t help thinking it looked like Homer Simpson when he says, “Mmmmmm, doughnuts,” and drools. See? See what I mean? And now I’ve ruined that sculpture for you forever. You can thank me later. 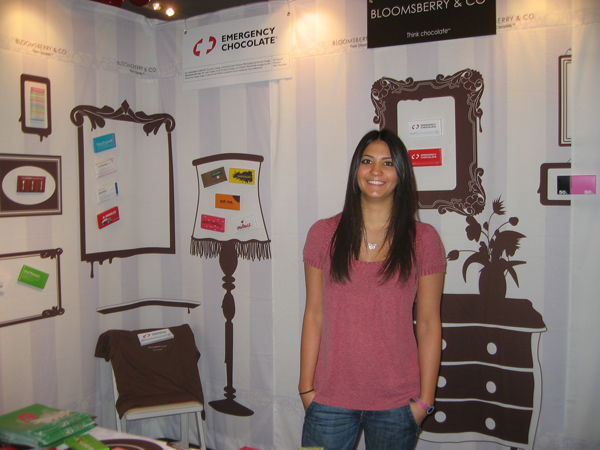 Bloomsberry & Co. Check them out if you have the chance. There was a lot of chocolates that looked like this. So pretty you almost don’t want to eat them. Almost. Look! 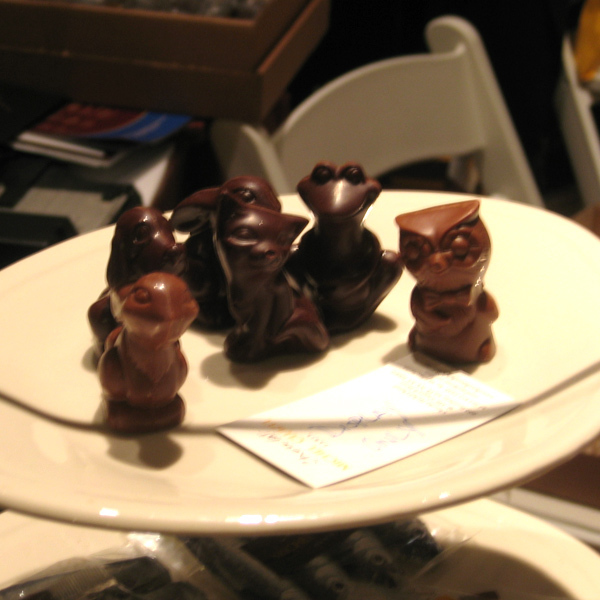 Little chocolate animals! So cute! This was a Japanese booth called Mary’s, based in Tokyo. They made the most insane green tea confections. Funny story, sort of: The very nice Japanese man gave this small child a sample of the green tea niblet. Now, I don’t know if you know this, but green tea can be kind of bitter. And this niblet had green tea powder all over the outside. So the child did precisely what you would expect her to do – put the niblet in her mouth, make a face like someone gave her earwax to eat, then stuck her tongue out and let the green tea niblet fall to the floor. I could have told Japanese Confection-Making Guy that that was a bad idea, but I guess in Japan they’re used to the flavor of green tea. Hey, more niblets for me! 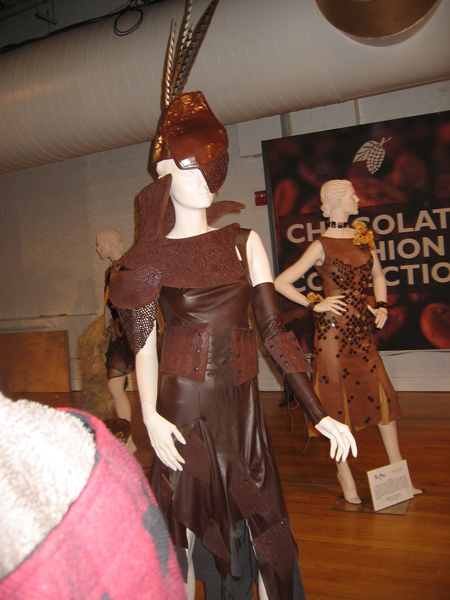 Then they had an area with the chocolate fashion show. This I don’t get. You want to cover yourself with a food item that melts with your body tempurature and is oily, stain-y and sticky? And at no point do you eat it? I iz confoozed. 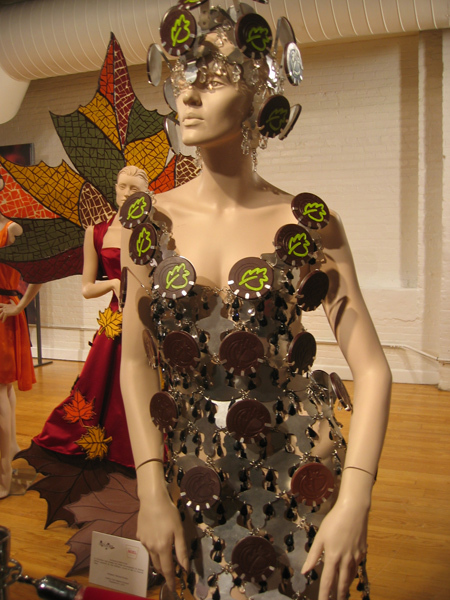 Also, the fashions were bah-heinous. I mean, super-ugly. Here are some samples of clothes I would not wear if given to me as a gift with a check for a large amount of money tucked into the sleeve. 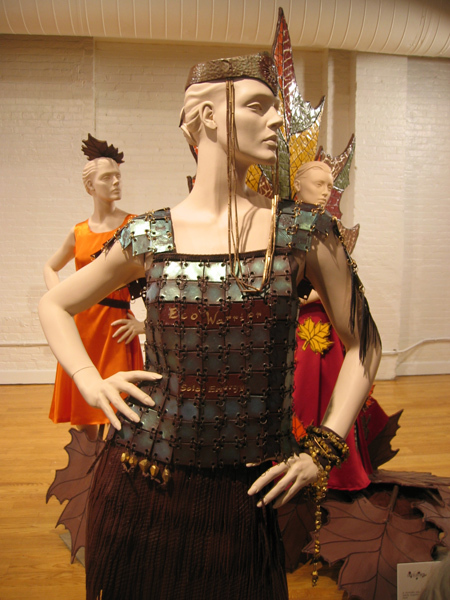 Arr, that be some craptacular garb these mannquins be sportin’. I don’t think I’ll go again next year (did I mention the $28 entrance fee?) but it’s worth checking out once. This entry was posted on Friday, November 16th, 2007 at 1:35 am and is filed under New York, Tasty 'n' Delicious. You can follow any responses to this entry through the RSS 2.0 feed. You can leave a response, or trackback from your own site.